One of the most daunting tasks our national clients face is to quantify the key metrics for making decisions for their office locations. I review no less than 30 different reports a year on this topic and the items people track are, well…daunting. Demographics, traffic patterns, access to amenities, cost of labor, office space costs, taxation, and the list goes on and on. As you look for a new office location, there are two particular metrics our clients review for opening a new office. The first is, can you attract new people to that market? With the U.S. at full employment, you either have to steal someone else from their existing job, or lure them to move to your new city. This means: Do they want to move to that city? 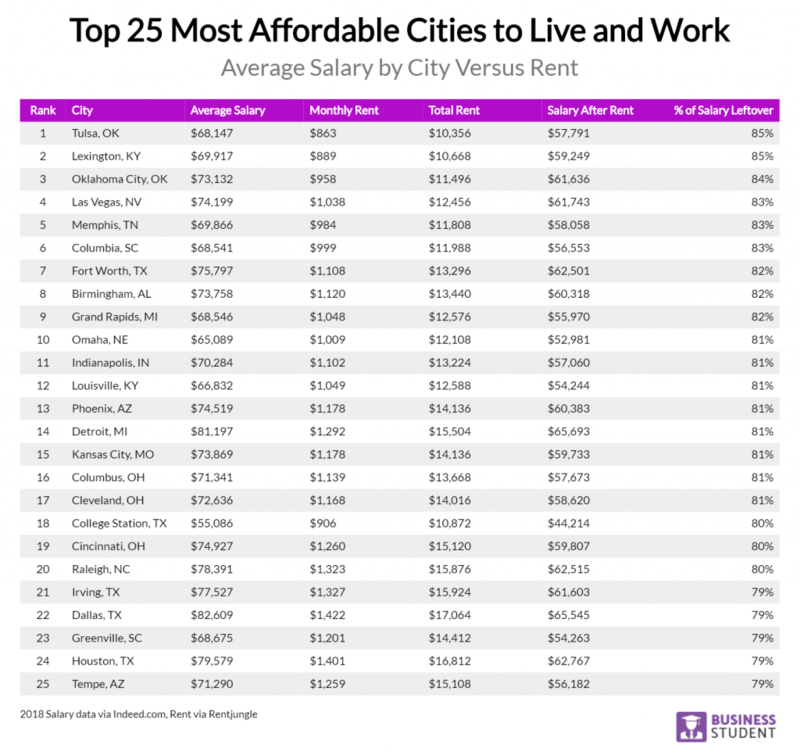 Below, is a simple article looking at the top 25 cities that new graduates would consider affordable (highest salary and cheapest rents). Guess what, Arizona has two cities—one metric why Arizona is growing and growing. Are you looking for a new office location? We deal with these metrics everyday, give us a call. P.S. I was recently on the Finding Your Frequency Podcast with Jeff Spenard and Ryan Treasure. We discussed real-estate, my new book, family and more! Click here to listen. For recent graduates, young professionals or folks considering a career change, affordability of housing often becomes the deciding factor in where they choose to look for a job. Of course, we all want to make the highest possible salary, but a souped-up paycheck in a city with sky-high rent won’t do you much good since you’ll have very little left over each month once you’ve paid your landlord. At BusinessStudent.com, wanted to see which areas of the country, and which specific cities in those areas, give business professionals the biggest bang for the buck, so we compared the highest quoted salaries from over 100 business-related jobs on Indeed.com to average rent for a two-bedroom apartment across America from Rentjungle.com and came up with the top 25 most affordable cities to live and work. 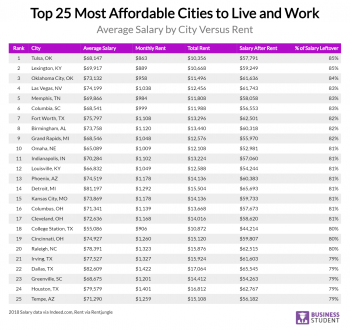 The average salary for the full top 25 is $72,230, and the overall average income left after rent is about 81 percent. Texas, the nation’s second most-populous state, is by far the overall leader on our list, placing a total of five cities in the top 25. The highest-rated Texas city on our list is Fort Worth, where the average worker has more than 80 percent of their income left after rent. The Midwest placed eight cities on our list, including three in Ohio alone. No spoilers, but you should strongly consider Oklahoma, as the Sooner State boasts two of the top three cities, including the overall No. 1. Dallas had the highest average salary at $82,609, while its Texas neighbor, College Station, had the lowest average salary at just $55,086. The cheapest average monthly rent was $863 in Tulsa, while the highest average rent was Dallas’ $1,422. Before you start your new job search, be sure to consult this list of the 25 most affordable cities to live and work in the U.S., but you also remember to take into account things like income tax (two of the states on our list, Texas and Nevada, have no personal state income tax), transportation and insurance costs. There’s no doubt you’ll consider probably dozens of factors when thinking about where it is you want to make a life for yourself. But for most of us, having ample disposable income, regardless of what city we call home, is one of the best ways to ensure that we can lead the kinds of lives we want. If it’s time for you to make your first start, or just a fresh start, a clear-eyed examination of hard data is the best place to begin. Whether you choose the winning entry on this list, Tulsa, or another city, be sure you’ve done your homework and are certain you’ll be able to get a lot of bang for your buck. A career in “business” is broad enough that it can mean just about anything. Hundreds, if not thousands of jobs, can be classified as “business” related work ranging from being an accountant to a chief medical officer. 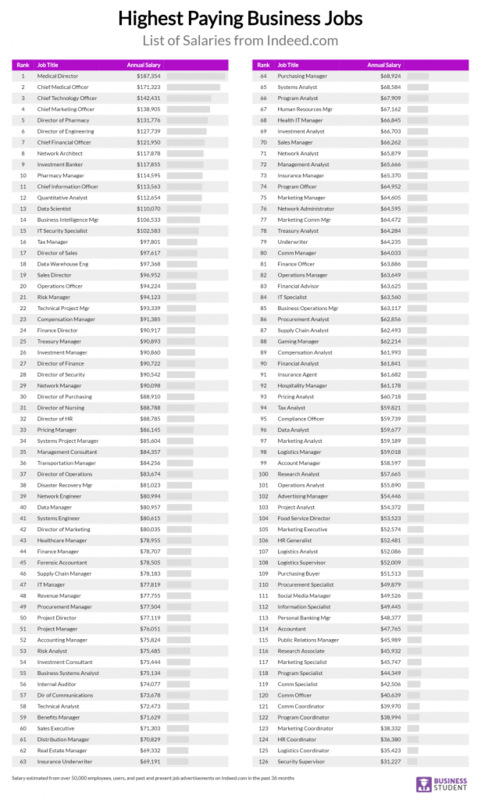 We created an index of 127 business careers, where we tracked the average salaries and how they vary by location. 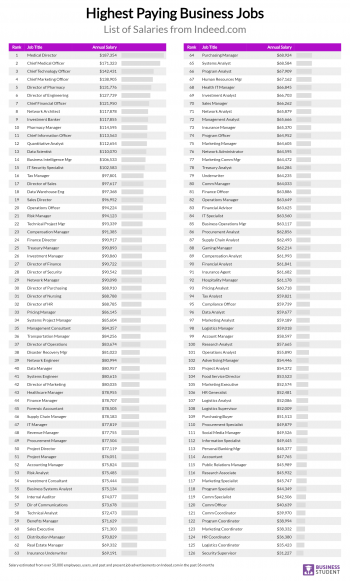 While these jobs are by no means comprehensive of all jobs in business, they comprise a representative index of business management careers and their highest paying salaries as well as jobs most commonly reported on Indeed.com. The highest paying job paid $187,000 on average in the United States (Medical Director). The lowest paying business job we track is (Security Supervisor), which pays $31,000 per year. The average business job we track pays $75,000 per year. Information is power. Please share our content for editorial or discussion purposes. All we ask is that you link back to this page and give proper credit to our author.